My love for mutton is there right from my childhood, in fact, I never knew how the chicken would taste for a long time. Yes, my mother's side always prefer mutton over chicken. And to my surprise, this prawn dum biryani is the most popular post in my blog and so I wanted to try mutton biryani with step wise clicks as it will be useful for mutton lovers like me. 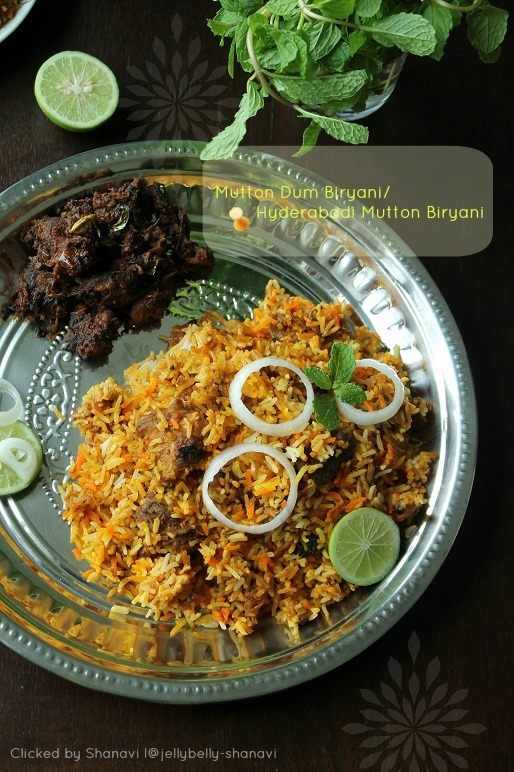 I would call this biryani a homely style dum biryani but since it is layered , u may call as hyderabadi mutton biryani. Njoy..
Mace /Javithri -- 1 no. Marinate the mutton with the ingredients given and keep refrigerated for minimum 1 hour. Slice the onions very thinly. Slit the green chilly. Cube the tomatoes. Clean the herbs and pick only the leaves and save in a bowl. Soak the basmati rice for 30 minutes. Heat a pan with ghee and oil until it's hot and season with the garam masala given as above, one by one over medium flame. Add the sliced onions, green chilly and saute well for a minute or two, also add a pinch of salt while sauteing and that would help the onions to loose the moisture and gets cooked fast. Later add the ginger garlic paste and saute the mixture until the raw smell is gone, may be 1 to 2 minutes. Add in the mint leaves,coriander leaves to the mixture ,stir together to mix well. Saute for few seconds. Add the mutton pieces and the stock to the masala mixture and bring everything together. Cover and cook the masala mixture on medium flame until the masala becomes gravy like consistency like in the pic. Switch off the gas and add the lime juice to the biryani masala, combine well. Boil 3 cups of water with the salt, garam masala and add the soaked basmati rice to the boiling water and add the lime juice. Cook the rice for 5 minutes, i.e. the rice should be 60% done. Remove the garam masala, drain the rice and keep it ready. Reserve the drained water in a bowl. Now take a deep bottomed vessel and add the half of the masala to the vessel followed with half the amount of cooked rice straight after draining. Again add the masala to top of the rice and again top it off with rice. Sprinkle the rice with the saffron colour on top. Cover the pan immediately with a tight lid or with some towel. Keep the hot bowl (which is filled with drained water) on top of the lid, just as in the pic.Heat a dosa pan on high flame and place the entire set up on top of it. Cook on high for 3 minutes and then keep the flame in sim, cook for 10 to 12 minutes. Switch off the flame, leave the biryani undisturbed for 10 to 12 minutes. Fluff the biryani using a fork and serve with raita. Here cup measurement is 160 ml for each cup, which is electric rice cooker cup's one. We like the mutton to be very soft, that's why we always precook the mutton and add it finally to the masala. Else, add the marinated mutton to the onion tomato masala, after the tomato is cooked, combine well. Transfer the ingredients to the pressure cooker and cook until the mutton is done. Then follow the remaining steps as described. Basmati rice I've used is not that much of a long grained variety and so it's short. Most process involves adding of salt, so be careful while adding salt. I've used Aachi biryani masala but adding the biryani masala is optional. beautiful presentation dear.. the first click is awesome.. Wow!! The briyani makes me feel hungry.. Very well presented step by step pics..
perfect biryani,u prepare it very well!! 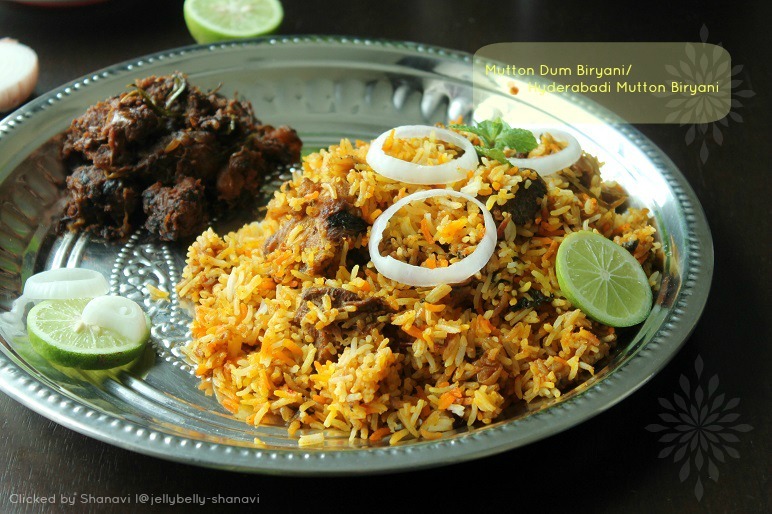 Ada ada Briyani summa adhiruthu pa, semaiya irruku..Wat a droolworthy,highly inviting briyani..makes me hungry..
excellent work...tempting me..i love the presentation..
wow delicious biriyani...happy to follow you.. I am always a fan of your cooking and love your biriyani a lot. I just made this briyani for lunch & came out well. Thank you. Great recipe, looks really tempting. I found a similar recipe of Hyderabadi Dum Biryani, where the chef 1st added a layer of the Chicken gravy, with rice on top and then topped it up with a mix of milk infused with saffron strands. Seems really interesting and delicious.